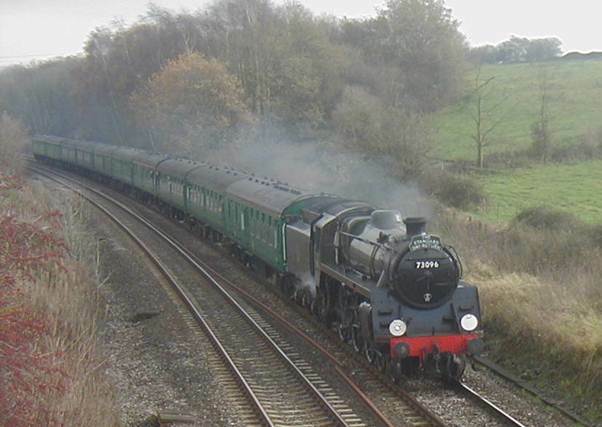 November 2002; a steam train was passing on a nearby line. I had to go and see it. There’s a fairly local overbridge which I know offers a good vantage point near Cheverell. I made my way there. And here’s the delightful scene as 73096 was taking a long way round between Alton and Salisbury. Now there was a time when I’d have thought little of a British Railways Standard engine. Number 73096 is, after all, younger than me, both in its design date and its actual build date. But by 2002 we steam beggars could not be choosers. In any case, 73096 did belong to one of my favourite classes of ‘standards’, helped along by my local Southern Region giving a few of these engines names from retired King Arthur class locos. 73096 was not one of the named engines. The first locomotive in the series appeared in April 1951. 73096 emerged from the works at Derby in November 1955. She was used on the London Midland region and also the Western Region – but not on my beloved ‘Southern’. In 1959 this loco was based at Shrewsbury. And she was still there in 1962. Her short life as an active engine in front line service ended in November 1967. She was purchased, for scrap by Dai Woodham where she languished for 18 years before being bought for preservation in 1985. And what a fine sight she made in 2002. I’ll forgive her lack of a Southern past for she looks the part as she heads a rake of carriages well matched in ‘Southern’ green. This could have been a train from my 1960s past. Actually, no train would ever have carried the headboard this one had which sounds more like a ticket of the 1960s – ‘Standard Day Return’. This entry was posted on November 27, 2012 at 6:46 am and is filed under railway. You can follow any responses to this entry through the RSS 2.0 feed. You can leave a response, or trackback from your own site.